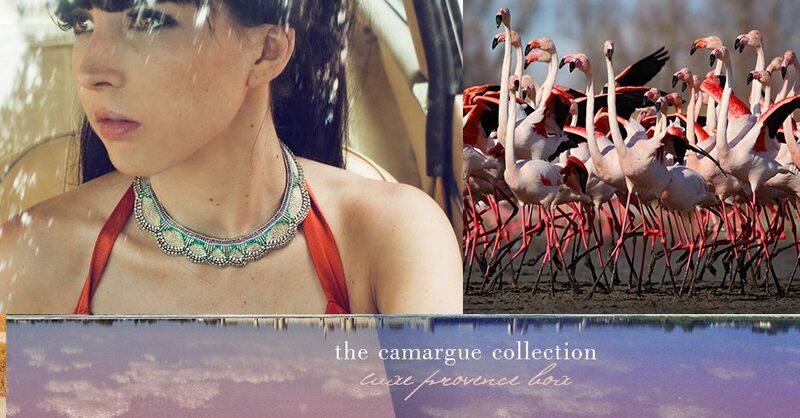 Our V7: Camargue Collection Luxe Provence Box has sold-out in a matter of days! 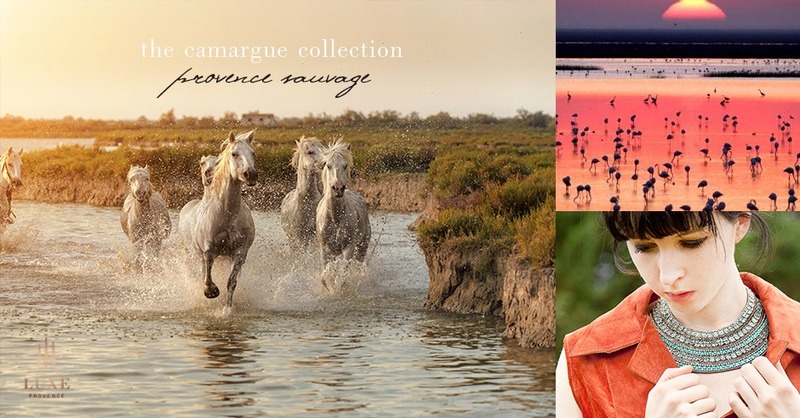 This Spring, we deliver the wild and natural beauty of the Camargue to your doorstep in our 7th Luxe Provence Box curation. Experience Provence’s “sauvage” region iconic for its galloping white horses, elegant pink flamingos, salt marshes and untouched beaches. We thought it was the perfect theme to kick off 2017. The shining star of this adventure curation is an ethnic, statement necklace combining ancient embroidery techniques with unique, luxury French design. 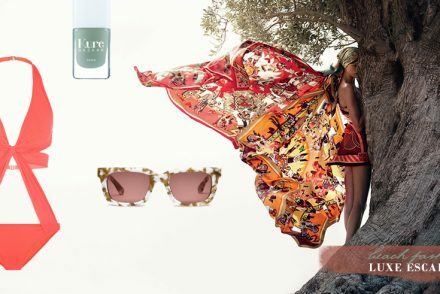 This stunning handmade jewelry is from upcoming French brand, Nahua, and perfectly represents the unique beauty found in Provence’s Camargue region. Each piece is designed in France featuring silk embroidery done by hand using indigenous traditional methods with a single piece retail value of $145 USD. Our VIP Annual members will receive their choice between the two models shown, the Damian and Tanya, each of equal value. 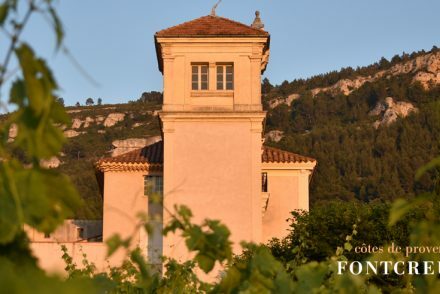 Our next brand featured, is one of the most prestigious and historic brands of Provence, Brun De Vian-Tiran, producers of ethically sourced luxury textiles since 1808. This father and son, family-run business is located in Isle-sur-la-Sorgue, which has a long history of working with silk and wool. We have selected one of their beautiful pieces that will help you transition into spring in luxury style. Today, fifteen sheep breeders manage flocks whose wool is certified with the appellation “Mérinos d’Arles Antique”, a fleece which is not just the finest – with a diameter of less than 20 microns – but the softest in Europe. Their 100% Mérinos d’Arles Antique collection, called “Camargue”, has given its true place to this noble wool, part of France’s cultural and historical inheritance and is featured in this curation. Its outstanding fineness is equal to that of Iranian Cashmere. 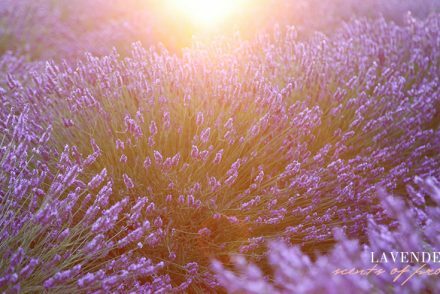 Made in Provence. The surprise item value from Brun De Vian-Tiran inside: $160 USD. Shipping: by DHL International Priority begins mid-March. This curation is completely, sold-out.